Your little...ahem...darling has a wicked sense of humor, always ready with smart, pointed joke or a well-placed prank. Things can get a little dark, but that’s why you love ‘em. Sounds like he or she would enjoy, then, a dark take on a perennial classic. 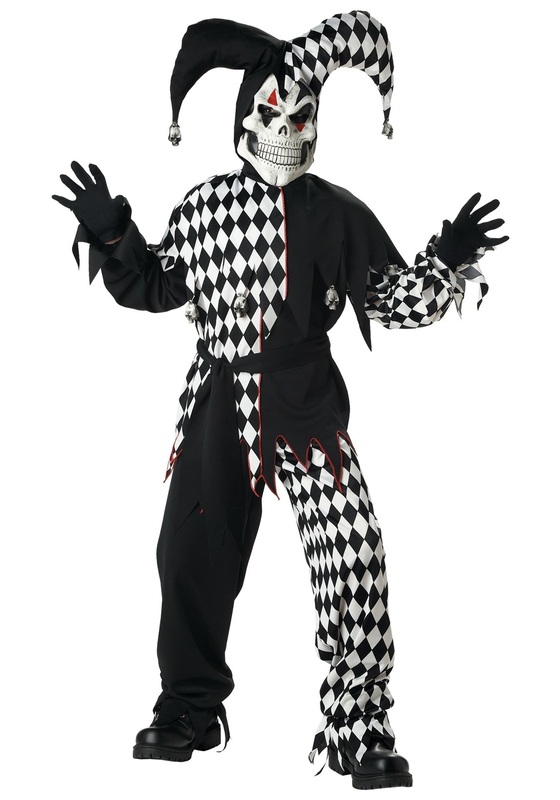 Your kiddo’s no fool; a classic jester costume has been done over and over again. 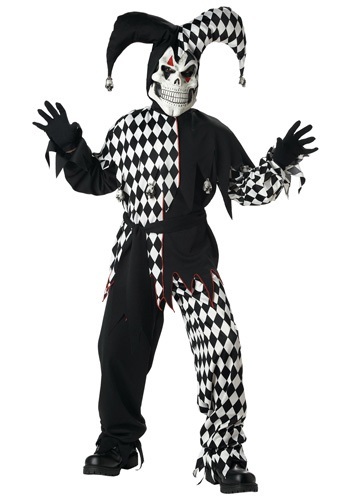 The Kid’s Dark Jester Costume, then, offers all the iconic aspects of a Renaissance entertainer...with a serious edge. Let’s not beat around the bush, here; this costume is, well, creepy. But your little laugh-maker has a fine flair for the dramatic. And everyone loves a scare on Halloween, right? Of course, as soon as he or she puts on this black-and-white pants and shirt combo, you’ll want to set a few ground rules. Trust us, you’ll thank us for the suggestions. 1) No telling his or her little sister she’s gone color blind, since obviously the outfit is red and blue (that’s just mean). 2) No putting on the molded mask and hood and popping up in bathroom mirrors behind you while brushing your teeth. 3) Actually, come to think of it, no putting on the molded mask and hood inside the house, period (shudder). While it would certainly be scary to pull down the covers and find this dark jester resting where your little one does, this costume is bound to be a trick-or-treating hit. Just add black gloves and a jester cane for a completely evil look, and have ‘em practice that evil laugh.